Near the beginning of David Holzman's Diary, the filmmaker of the title speaks directly to us as he explains his idea to find himself by making a documentary of his life. He repeats Godard's famous quote, "Film is truth 24 times a second," only he omits the ending of Godard's statement which says, "and every cut is a lie." Of course, if Holzman finished the quote, he might give away the game because when director Jim McBride's film began to screen in 1967, many thought it was an actual documentary. It wasn't until the end credits appeared and viewers learned that Holzman was played by an actor, L.M. Kit Carson, and the film had a screenplay that they realized they'd been had by a deadpan satire of the cinéma vérité-style of documentary prevalent at the time. More importantly, the mockumentary was born, inventing a practical cottage industry spanning from Woody Allen's Take the Money and Run in 1969 through the current Emmy-winning sitcom Modern Family with much in between. 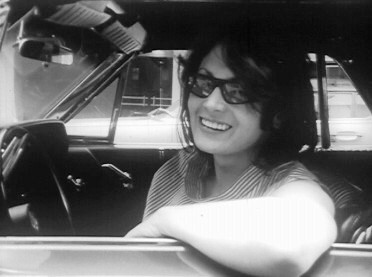 I'd never seen David Holzman's Diary which isn't surprising since, despite its acclaim, including being added to the National Film Registry in 1991, the film never had a real release in the United States outside of film festivals, film schools and museums. It received more attention in Europe before gaining notice in the U.S. and has never received a Region 1 DVD release, though that will soon be rectified. I only was able to see the film thanks to the good people at Fandor, who invited me to review ahead of it being the first of its new program of coordinated digital-theatrical releases. Unfortunately, at the time I was swamped with projects and my weekly Treme recaps. Fandor was kind enough to send me a screener anyway and I finally got a chance to watch it and this is the first chance I've had to write on it. Right now, the only place people in America without a region-free DVD player (or a still-working laserdisc player and the old Criterion laserdisc) can see David Holzman's Diary is on Fandor. However, Kino Lorber announced on its blog that it will release a special edition of the film on DVD and Blu-ray on Aug. 16 and it's available for pre-ordering now. Whether any other home rental services will acquire the film is another story. Now when I began watching David Holzman's Diary, I knew it was a joke, so it's interesting to consider how the reaction differs for someone going in knowing a spoof is at hand versus someone who doesn't. (To peer inside a time capsule, check out this 1971 review from The Harvard Crimson where the writer was "moved" by the film until the credits pulled the rug out from beneath him, revealing the joke, and starting an argument with a friend over whether or not to mention that it wasn't real in the review.) This isn't the type of laugh-out-loud mockumentary we've grown accustomed to as with the best of the Christopher Guest films, This Is Spinal Tap! or Woody Allen's Zelig. Diary will bemuse you more than it strains your stomach muscles from strenuous chuckling but that's because while the film has humor within it, its real targets reside outside the movie itself. 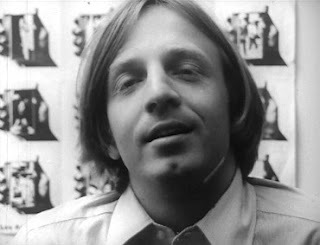 If you see or re-watch some of those real cinéma vérité documentaries, that might be where you'll have delayed reactions to some of the setups that David Holzman's Diary provides. That doesn't mean Holzman's Diary lacks funny moments all its own. It contains plenty, such as when David interviews Pepe (Lorenzo Mans) who suggests that Holzman's life just doesn't justify a movie, saying it's not an "interesting script." There is the priceless near-monologue that Sandra (Louise Levine) delivers from her car on a Manhattan street that McBride said in an interview was mostly improvised and occurred by happenstance. Then, there are all the moments involving David and his love Penny (Eileen Dietz), who does her best to stay away from Holzman's camera, prompting her boyfriend to say that he just doesn't "get her sense of privacy," something that will send her heading for the door eventually and foretells the morphing of that documentary style he's spoofing into reality TV, such as covered in the HBO movie Cinéma Vérité earlier this year that told the story of the making of the landmark PBS series An American Family about the Loud family. In a way, it also predicts part of the outcome for the Louds as well as making the film nearly destroys David's life as An American Family did a number on the Loud family as well. Strikingly, while David Holzman's Diary might be a spoof of a very particular style of documentary filmmaking, when it's dealing with David coping with his flailing relationship with Penny, it reminded me of a real and great documentary that wouldn't come out until nearly 20 years later: Ross McElwee's Sherman's March, when McElwee's planned documentary about the path the legendary Civil War general took gets derailed by the breakup with his girlfriend. While David Holzman's Diary isn't a real documentary, it does display its own sense of truth in terms of time and place by showing in crisp black-and-white, a view of N.Y. neighborhoods on the Upper West Side at that time. In another sequence where David films himself flipping through TV channels, you catch quick glimpses of Batman and Star Trek, which would have been in first run. The movie was filmed by Michael Wadleigh (though his name is spelled Wadley in the credits) who would go on to direct one of the great music and cultural documentaries two years later, Woodstock. Considering that David Holzman's Diary was made 44 years ago, Jim McBride actually has a rather slim directing resume. In the seven years after Diary, McBride made three short real documentaries and two features, but then he didn't helm another film until the 1983 remake of Breathless starring Richard Gere. 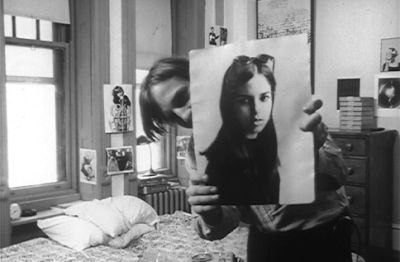 (What would David Holzman think of McBride daring to remake Godard's French New Wave classic?) His next two films were much better: The Big Easy and Great Balls of Fire, both starring Dennis Quaid, but most of his directing work has been on television, including several episodes of The Wonder Years. I guess you can't take McBride out of that era. Thankfully, he gave us David Holzman's Diary and even better it has finally returned where more film enthusiasts can have access to it. With all the upheaval with formats, Net Neutrality fights in Congress that could affect streaming and a shaky economy that might someday soon make it so only people of means will be able to afford entertainment, it's good to know we have this window to see David Holzman's Diary so it doesn't vanish as I fear so many film titles will (with book titles possibly not that far behind).